People from all walks of life request an audience with Hazrat Amirul Momineen, Khalifatul Masih Vaa and discuss a variety of issues with him. Recently, on Saturday, 30 March, a delegation of a South Korea based NGO visited Hazrat Khalifatul Masih, may Allah strengthen his hand, and spoke on topics of mutual interest. They had specially travelled for this audience. They invited Huzooraa to attend the World Congress that they organise every year in September with the aim of promoting global peace. They showed Huzooraa a video to give an idea of the scale and nature of the event and its objectives. Huzooraa appreciated their efforts and expressed that it was indeed a time where all groups needed to work together for the cause of establishing world peace. They presented to Huzooraa some souvenirs and literature about their organisation. Huzooraa presented newly published books of the Jamaat where Huzoor’s addresses to various parliaments and dignitaries around the world have been collated. German MEP Bernd Lucke paid Huzooraa a visit on Tuesday, 2 April and discussed various matters to do with the current situation of the region. Mr Lucke has founded a new political party Liberal Conservative Reformers (LKR) and Huzooraa enquired about their agenda and manifesto. This naturally led the discussion to the political climate of Europe and how it is influencing the world at large. Mr Lucke felt that the message of Ahmadiyyat should be more commonly known in Germany than it was now and also voiced certain suggestions that he had for the Jamaat’s outreach schemes. He was of the opinion that Ahmadi requests for political asylum were straightforward and should receive immediate response and a positive outcome. 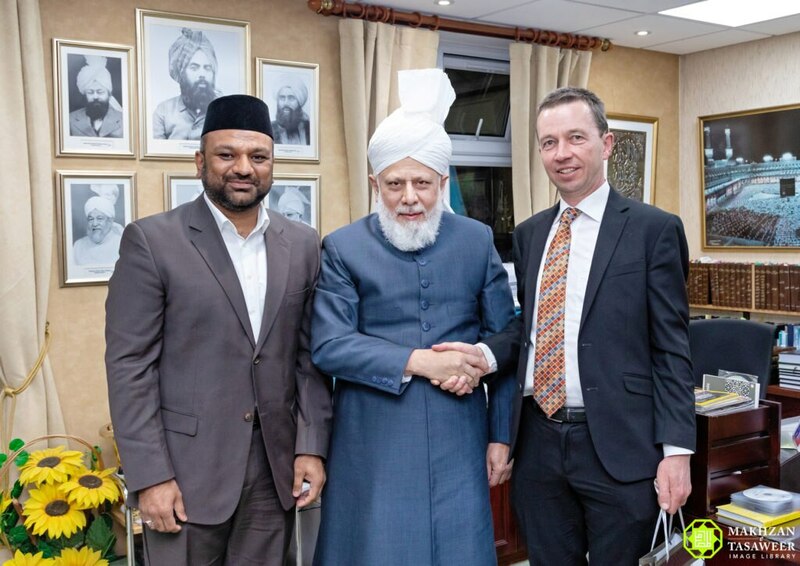 “Once a friend, always a friend” were the words that Hazrat Khalifatul Masih Vaa concluded this meeting with. 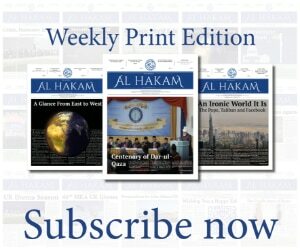 Mr Lucke highly appreciated this gesture of goodwill and expressed that he too felt the same about the Ahmadiyya Jamaat. 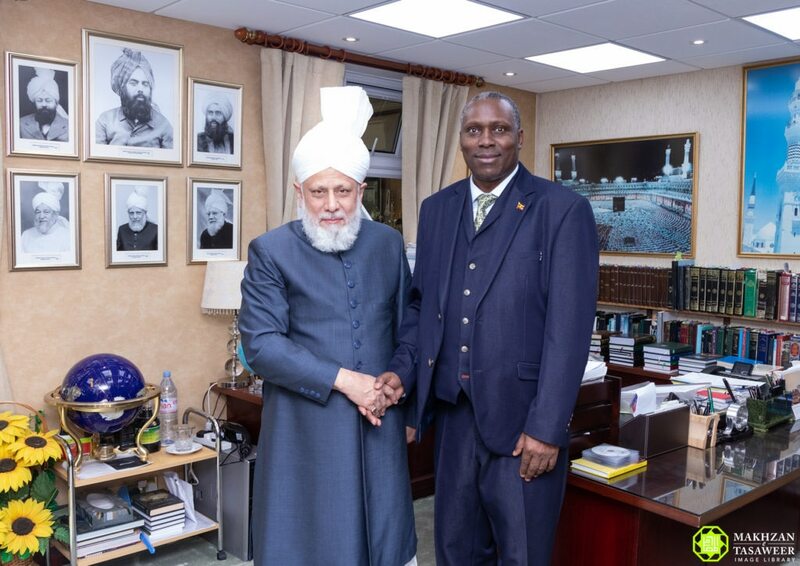 His Excellency Julius Peter Moto, Ugandan High Commissioner to the UK also had an audience with Hazrat Khalifatul Masihaa. He found a common interest and informed Huzooraa that he was a farmer before becoming a politician. Huzooraa, with his particular interest in agriculture, discussed with him many areas of agriculture and mentioned his own experiences in the field. Huzooraa expressed his opinion that if African leaders focused on remaining honest to their peoples and duties, Africa could soon become the “breadbasket of the world”. Agriculture made its way back into the discussion and Huzooraa advised the high commissioner, Mr Moto, that since the African climate was favourable for all types of crops, more areas should be explored and not limit the agricultural pursuits to only a certain type of crops. Huzooraa said that this could lead to more exports and, subsequently, a better economy.